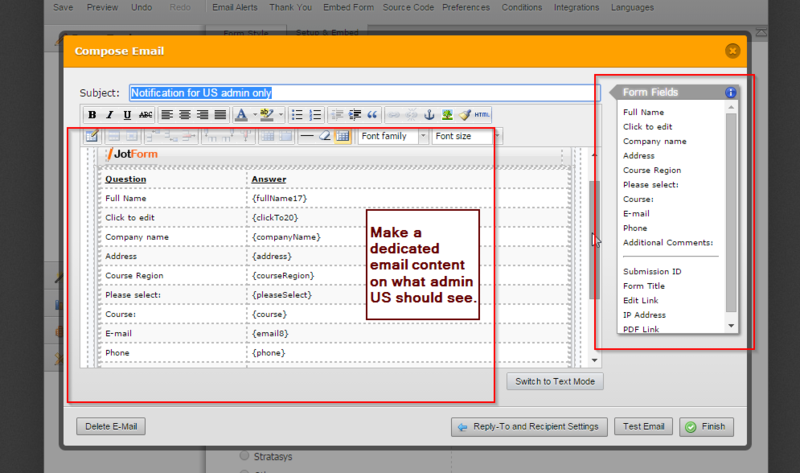 when the user click on the button 'Register for USA' - the admin that got the email after submitted , should get this value , and in addition , by this field I need to defined different email address per the region admins. 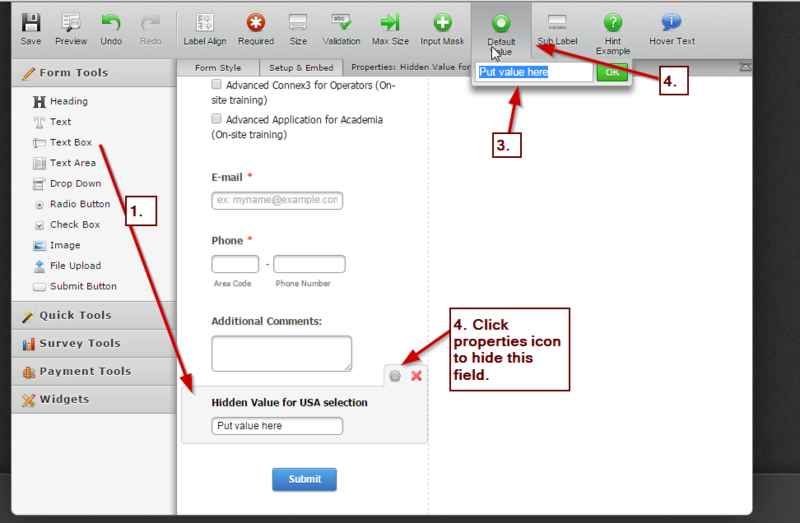 do you think it possible to add this value, taken from the URL and to be send to the admin with all the details that the user inserted in the form. I see from that previous thread that you already have some suggested workaround from my colleagues, I'm not sure if I understood your concern correctly. Perhaps it would be more easy to understand if you could give us a step by step workflow process on how the email should be sent, receive and what data you need? 3. What does admin expects to receive? I have attached screenshot below to see if this is what you meant. A. I added a new email notification but dedicated to US admin only email. B. 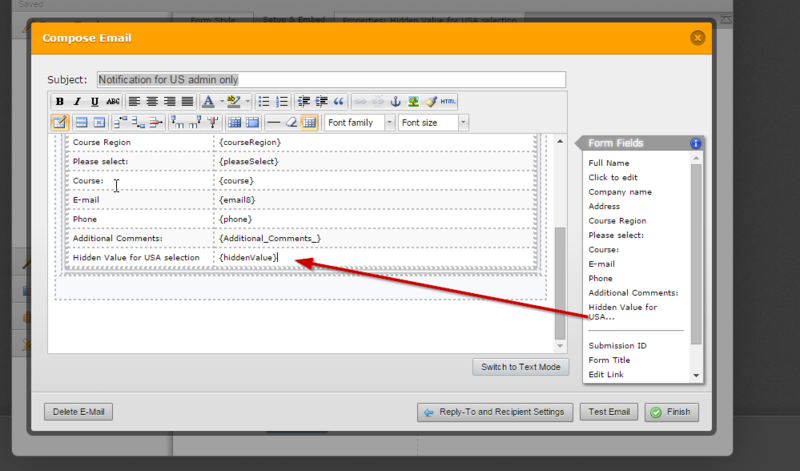 Inside the notification for US admin, adjust the contents to what you want them to see. C. If you are referring to custom values in the URL, I would suggest using hidden fields in the form rather than values in URL. Ex. 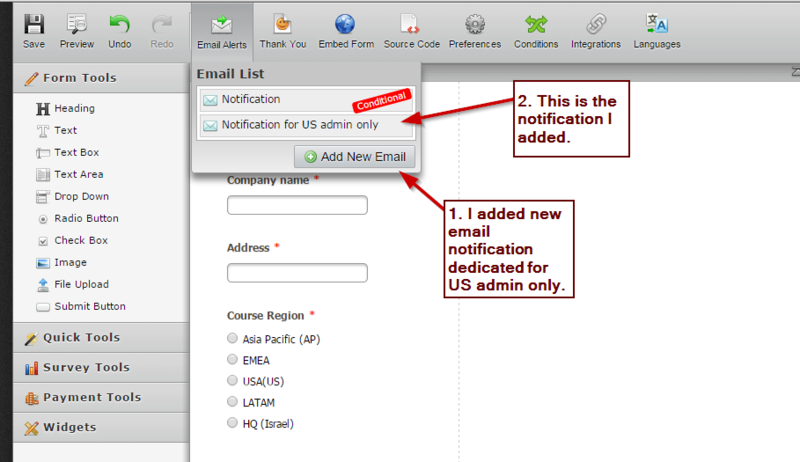 I added a hidden value dedicated to see only by the US admin in his/her email notification. D. I went back to the email notification and added the hidden value. Please do take note that you check each Email Alerts notification and adjust to what content each email should only see. I hope this helps or at least gives you an idea on how to proceed on your form. Let us know if you need further assistance on this. Thank you very much , I follow step by step on your instructions , and it works ok for me. I removed my email from the ‘Conditions ‘ screen , but still got 2 emails. Is there another place that emails can be configured? Thank you for letting us know that the solution of our colleague works.